Edit – I just had this pointed out to me that on Friday 17th March Lee Holmes wrote about this very attack on his blog here – http://www.leeholmes.com/blog/2017/03/17/detecting-and-preventing-powershell-downgrade-attacks/. This is a pure coincidence and I was not aware of this blog post by Lee at the time. We all know that Microsoft has added some nice features to PowerShell v5 to help out the Blue teams, Constrained Language Mode, Deep Scriptblock logging, system wide transcripts and AMSI to name a few. This blog is not a lesson on each of the features mentioned above, for more information this is a great place to start – Microsoft PowerShell Blue team. This blog is also not about the awesome bypasses highlighted by Casey Smith, aka @SubTee, again detailed info can be found here – @SubTee Blog. What I’ve found is probably not even new, but I can’t find anything written about it. This is a very simple and almost too easy a way to bypass Constrained Language Mode. I still can’t believe it myself. Since the release of PoshC2 we’ve been hard at work to improve the tool and we’ve recently added some more payloads to the tool. In addition to the original payloads we’ve added new weaponised Excel, Word and PowerPoint documents. These are blank documents that have the implant embedded into them, ready for you to add content to. We’ve added a payload that exploits the MS16-051 Internet Explorer – vbscript_godmode vulnerability. Credit goes to – http://theori.io/research/cve-2016-0189 for the exploit. The html payload can be copied directly to a webserver were victims can be directed to in a Red Team or social Engineering attack. As can be seen above there is a revised layout to the engagement folders, a much cleaner layout. Further work to improve the whole tool are ongoing and further new features are planned. Get PoshC2 here – https://github.com/nettitude/PoshC2, also checkout the wiki for detailed information on features and usage po PoshC2. You have obtained some level of admin creds, (local, domain or otherwise) to a windows server/domain, there is no RDP. There is however the WinRM service, PSRemoting to give it its other name, this allows an admin to create a remote PowerShell session to the server and run commands or scripts, very much like the ssh service used on Linux systems. The admin level creds you have will allow you to connect to the remote server(s) via PSRemoting, and you will want to run hacker PowerShell tools in the remote session to further infiltrate the server or systems, however, given the lack of RDP and the locked down state of the network and services, you may struggle to get the likes of PowerSploit onto the remote system. So for instance we might want to run Invoke-Mimikatz on the remote server to extract clear text credentials stored on the server. Lets explore PSRemoting in a liitle more depth. 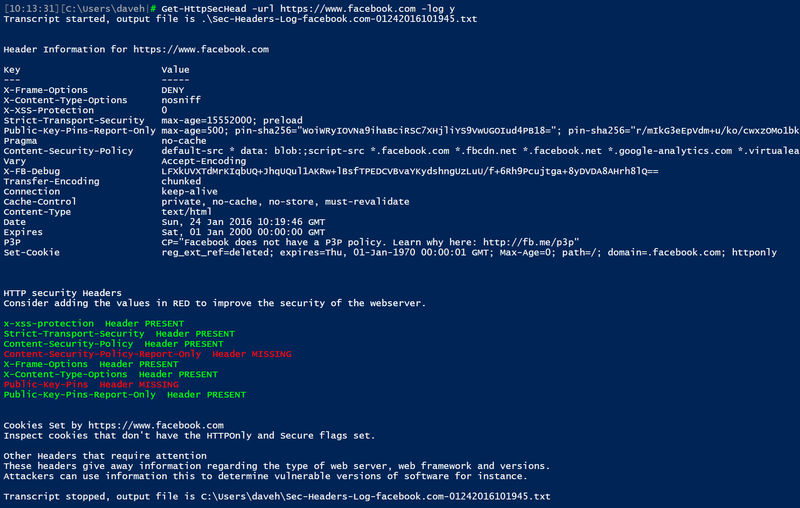 I wrote this little PowerShell script to quickly test for HTTP Security Headers. It still needs improvements, but it’s mostly there. I’ve added logging functionality to write all of the script output to a file. Also forgot to mention this script requires PowerShell 3.0. A colleague @benpturner and I came up with this from an idea I had, it gives an Interactive PowerShell session from Metasploit, using newly developed Metasploit payloads. Update to Metasploit Framework v4.10.1-dev – Changes needed. The recent update to Metasploit Framework 4.10.1-dev, brought in some changes, but some stuff stopped working for me. Firstly the new changes required me to copy my database.yml file into a newly created folder in the frameworks directory. And to change the prompt in the console so it tells me my local ip address and how many sessions and jobs are running. or as I do, use a small shell scriptlocated in /usr/local/bin, which takes care of starting and stopping thepostgresql server as required. This should make things work as they previously did. If your file and folder locations for the framework are different make sure you substitute them into the the commands.